‘Good girl’ Jessika is heading stateside. 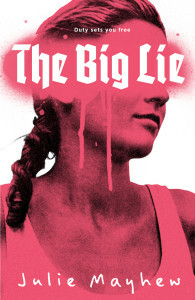 Candlewick Press – who have already swiped the rights for Red Ink – will be publishing The Big Lie in America. They sent us Jay Acker and now I’m sending them… No wait, I’m mixing fact and fiction there, aren’t I? Nevertheless, I’m feeling a million dollars* about selling a second book to the US, and thrilled to be staying in the Candlewick stable. What an interesting time to be sending a story about revolution across the pond. Can’t wait to see what happens. In all senses of that phrase.